and forget about being you or me. and each go east or west. This evening I thought I'd post the practice I work upon in the Studio here in Scotland. After yet another fruitful trip to China I managed to obtain some superb paper which is probably meant for calligraphy but, as the Owner said ion the Art Store, "You use it as you feel." This painting is a little saddening for me as, because of the origin of the material, I remember the elements that cost me someone I deemed a friend. I think greed got in there somewhere. I purchased from someone a pair of ink sticks. Nothing unusual there... I had purchased many things from this person and to the tune of over £1000ukp but these two ink sticks were destined to cost me £100 or so with shipping. Upon using them it was apparent that they were at least 80% glue. That being the case they were the sort of "tourist" objects sold to travelling holidaymakers and not Artists. This is common and in the 14 years I have studied this field I have seen it and been victim to it many times. On this occasion there was no reasoning with the person supplying. These were definitely NOT Huishi Hu Kaiwen ink sticks from the revered Chinese oldest Ink Stick factory. I videoed the results twice and on each occasion the excuses got wilder and wilder. The ink sticks were supposed to be identical in use to the one I already have; a genuine one that works and makes ink in about 2 minutes. The pair delivered didn't make anything more than very pale grey dishwater. The person supplying them insisted they were genuine and became offensive and I had to walk the other way I'm afraid. Life's too short to suffer antagonistics. The books I studied to get this painting were supplied by her hence the disappointment of their memory in use. But we have to move forwards when we are bitten so many times in life. Sometimes in the evening I sit and look at a particular painting by Chao Shao-An. Then I sit and look at the colours and wonder how thin the paint was in some parts of the painting. Then I look at the scratches where the bristles have split and scored lines with the main body of the brush head. Then I look at the range of colours used. and how much quieter they are than the main subject; the point of interest. Then I choose some paper. This is a copy of a painting he has done. Then I will paint this again & again & again. And when I feel a degree of fluency come through I'll change the bird and change the flora. Such as it is. For me it's something beautiful to leave the computer behind with Animation and Dragons, Elves and Ogres and sit outside electronica and paint in this ancient fashion which is where the initial drive to paint Chinese came from. "In Situ". Studying hard the practice of Chao Shao-an style Chinese Painting! But Phones are definitely not worthy of displaying our Works? It's been a while since I've felt the need to write something inside this Blog. Actually, its not a blog, it's more of a standard website from the days of the 1990's in so far as it allows full width formatting and shows the Paintings I work on and from in large detail. Big enough to see without pussyfooting about with fade in galleries and giant arrows on the images. I hate that. Artists need S P A C E . Not between the ears either. The ability for other artists to display their work seems to have been crushed with social media sites. I host with HeartInternet utilising the fastest servers on the planet without limits on space or bandwidth because you need something of a vehicle to display what you're doing in the Arts with impact. Too many people are sadly dependant on squinched up little images shown on what basically amounts to a Phone site. How on earth we're supposed to impress a client or potential customer with an image three inches across baffles me and the design of sites that are "phone shaped" and only utilise the middle third of a screen...... and that's acceptable? The only way to seriously browse the web is through a proper desktop device or large laptop. If you're on a "just passing" crusade with your life and its progress and your study levels mimics this.... then so will your life achievements. I'm afraid a postage stamp sized representation of your achievements...... kind of self declares by its size, the level of achievement to onlookers. I'm happy to say that Darlene Kaplan, an American Chinese Art Enthusiast of some note who is quite achieved in this field in the states has taken up the offer I put out on a social site of having a full scale blog to post her work on. I get the impression that it is a challenge for her as web technologies are not her hot spot but... she is ready for the challenge and already has several online prescences though sadly... some adhere to the failings stated above. One of her sites kind of hung off left on 27% of the screen. Who the hell designs these things? SEE HERE Darlene's newa nd upcoming Blog....... and bookmark it because it will be worth your attention And, as you'll see, it uses the whole of that brand new monitor your new computer came with. Not just the middle third bit. Her works are seen across the planet andif, like me, you've been in the field a while and enjoy seeing the work of others because you can now appreciate it, her posts will be worth the time it takes to read them. Old coding still works, it's just called something ridiculous now. In 1994 we used "variable parameters" on the pages so that it didn't matter what you viewed the site on it organised itself to fit. Now they call this "Adaptive" as if its some kind of magic programming that's come about but in truth, its been missing for years because programmers and coders and internet designers have been lame, lazy and basically..... crap. Spewing out nonsense sites and convincing their clientele that "This is the way forwards!" I hope that by the next decade's end we have a system where people are once again looking at high definition internet sites on large viewers because if you went to the movies and were handed a three inch handheld pocket device to watch the movie on while you walked around the refreshment booth, you'd want your money back. Increasing Numbers to the Chinese Arts in the West. Pleasingly, there are more and more people taking up the Chinese Arts. Sadly, too many are mixing it with Westernisms and this is a contamination not tolerated by the traditionalists in China. That's a bit like going out for a Chinese meal and then being asked if you want some Bisto poured all over your rice. So why play this game with something that's historically beautiful. No, I have zero toleration for Western Infiltration of pollutants in this most ancient art to the degree there is nothing western on my Art Table at all. I have never indulged in Western Style Painting. only Chinese. I am lucky in this respect as I have no habitual traits to spoil the progressive walk I demand from it. Are you an Artist looking for a way to display your works? Bigger than the patronising social sites allow you? You can write to me and we can see what can be done. The New Landscape of Chinese Ink Painting ! From "Fresh Ink," Arnold Chang's Secluded Valley in the Cold Mountains (detail), 2008, handscroll, is a response to Jackson Pollock's classic drip painting Number 10. Contemporary Chinese art has attracted so much attention in recent years that it is hard to imagine any overlooked artist or movement. But while many oil painters and conceptual artists like Cai Guo-Qiang and Zhang Huan have become art stars and millionaires, practitioners of traditional ink-and-brush painting have largely been ignored. Now, with major exhibitions in the works at U.S. museums, and with strong results in the auction houses, contemporary Chinese ink painting is finally moving into the spotlight. "It is time for people to get to know about China in a more esthetic, contemplative way," says Hao Sheng, curator of Chinese art at the Museum of Fine Arts, Boston, where his exhibition "Fresh Ink: Ten Takes on Chinese Tradition" will open on November 20. The exhibition will pair works from the museum’s renowned collection of Chinese painting with art made in response to it by contemporary Chinese artists, many of whom are trained in classical ink painting. 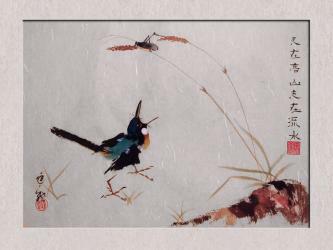 Painting with brush and ink on rice paper is a traditional form of Chinese painting. "I prefer to call it 'calligraphy painting,' a type of painting that is influenced by a literary imagination and the written word," says Johnson Chang, curator and owner of Hanart TZ Gallery in Hong Kong, who has been at the forefront of promoting contemporary ink painting for the past two decades. "Ink art," as some curators call it, can encompass a wide range of untraditional techniques, even multimedia productions that evoke classical art and the literati tradition. "All the contemporary formats of art can combine with the tradition of ink painting," says Kuiyi Shen, professor of Asian art history, theory, and criticism at the University of California, San Diego, and cocurator (with Britta Erickson and Lu Hong) in 2007 of the Third Chengdu Biennale, which was devoted to contemporary ink painting. "Ink is an idea, an esthetic, that can reflect ideas of modern people," he emphasizes. Focusing on artists who demonstrate a relationship to the past, Hao Sheng found a surprising range of approaches within the ten he selected for "Fresh Ink," from the Chinese American Arnold Chang, who studied classical ink painting for more than 20 years, to the MacArthur Award-winning conceptual artist Xu Bing, who recently returned to China, after more than a decade in New York, to serve as vice chairman of Beijing's Central Academy of Fine Arts, China's leading art school. "These artists' relationship with tradition is very diverse," says Sheng. "There are those who seek to hold up the highest standards. Then there are others who seek to subvert them. But these challenges are also based on a deep knowledge of what the tradition is." Scholars have been interested in contemporary ink painting since the inception of the New Ink Painting movement in Taiwan and Hong Kong, in the '60s, but "Fresh Ink" will give a wider audience an opportunity to see ink painting made by living practitioners. The MFA’s collection provided plenty of inspiration for the artists. Yu Hong, a woman artist, chose to respond to Court Ladies Preparing Newly Woven Silk (early 12th century) by painting directly on silk banners. Traditionalist Li Huayi, inspired by Northern Song dynasty scrolls, inscribed a landscape of craggy mountains, pines, and clouds on a series of screens. Qin Feng made calligraphic abstract strokes across accordion-like, towering screens. Xu Bing, known for his experimental approach to Chinese characters, took the 17th-century Mustard Seed Garden Manual of Painting as his starting point, scanning motifs from it and rearranging them. "The concept of learning from the past is something that happens in all art making but certainly has deep tradition in Chinese art," says Sheng, referring to the Chinese academic training that requires students to learn by copying the masters. Ironically, many of the artists in the show had seen the classical works only in reproduction, since so many masterpieces were smuggled out of China during the civil war of the '30s through the Communist period. "I am not attracted to ink painting because it is a hot new area," says Arnold Chang, who lives in New York. "I've been doing ink painting since I was a kid." Chang was taught by the master painter and collector C. C. Wang and also studied with James Cahill, the prominent scholar of Chinese art at the University of California, Berkeley. 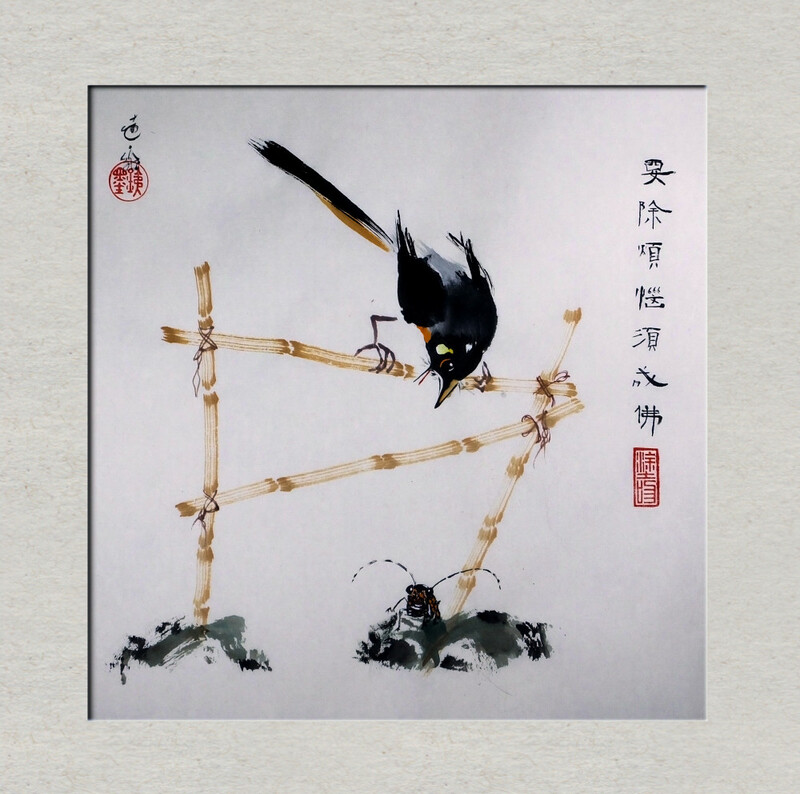 He thus acquired better training in ink painting than many of his colleagues in China, especially those who grew up during the Cultural Revolution, when traditional art forms were considered feudal and antirevolutionary and were strictly forbidden. For the exhibition, Chang chose a non-Chinese work, Jackson Pollock's Number 10 (1949), and produced a landscape of similar dimensions. "I am a contemporary artist, yes, but how do we define contemporary Chinese art? Is it contemporary art done by Chinese people? Or is it Chinese art done by contemporary people?" Placing himself and his art in the latter category, Chang acknowledges that works like his appeal mostly to those already steeped in the classical tradition. "If it opens up the world of actual Chinese painting to contemporary audiences, then I would feel completely gratified," he says. In contrast to Chang's conservative approach, many Chinese artists are taking liberties with what is sometimes called the "ink esthetic." Qiu Zhijie, for example, is a conceptual artist who has made photographs, installations, and ink drawings. In 2009, when his works were not released from customs in time for the opening of a show at Chambers Fine Art in New York, he painted a surrealistic landscape, reflecting his circumstances, directly on the gallery wall. For a recent show at Contrasts Gallery in Shanghai, curator Gao Minglu, a renowned scholar, selected artists who were considering ink from various points of view, including He Xiangyu, who made pigment from Coca-Cola, and Zhang Yu, who made pictures entirely from his inky fingerprints. "In the past, ink painting was a very elitist sort of thing, but now contemporary artists use it to address daily life," Gao says. "My main focus is to look for works where the artist is still resonating with the past in some way," says Maxwell Hearn, curator of Asian art at the Metropolitan Museum of Art in New York, who is planning a contemporary-ink survey show. His recent exhibition "Mastering the Art of Chinese Painting: Xie Zhiliu (1910–1997)" gave audiences an idea of how a 20th-century master of ink painting prepared for his projects. Although Xie represents an older generation, his estate was an invaluable find, because it included sketchbooks and tracings that had clearly been used to make the seemingly spontaneous paintings. 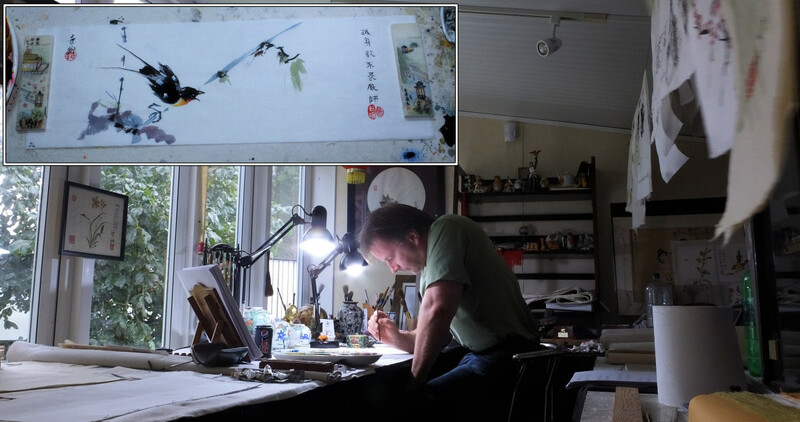 "I had always had the idea that Chinese artists meditate for three days in front of a blank piece of paper and then create beautiful masterpieces. But, no, Chinese artists, like Western artists, make preparatory sketches," Hearn says. Most museum curators in the United States have been trained in classical but not contemporary Chinese art, and they would like to build a bridge between the two. Ink painting is popular in China, where it is practiced by amateur enthusiasts as well as trained artists. It has generated important shows. In Hong Kong, where there is a large community of collectors and supporters of ink painting, dealer Alice King is spearheading a movement to establish a contemporary-ink museum in the West Kowloon Cultural District. "It is something that the West hasn't really understood or been keyed into, but anyone with an understanding of ink painting sees that it is one of the really important movements at the moment," says independent curator Britta Erickson, author of On the Edge: Contemporary Chinese Artists Encounter the West, who is currently working on a series of videos about contemporary ink painters. There is certainly a growing interest among Chinese collectors for works by 20th-century masters of ink painting. In May of this year, Aachensee Lake (1968) by Zhang Daqian sold for an astonishing $14.8 million at China Guardian Auctions in Beijing. The figure rivaled records achieved by such contemporary art stars as Zhang Xiaogang and Yue Minjun and demonstrated the strength of the market for modernist ink paintings in mainland China. Just weeks later, Christie's Hong Kong made more than $27 million in a single afternoon sale of modern Chinese paintings, with works by Fu Baoshi and Xu Beihong attracting bids topping $1 million. Contemporary ink art is featured in galleries specializing in contemporary Chinese art around the world. In New York, it can be found at Chambers Fine Art, Ethan Cohen Fine Arts, and China 2000 Fine Art; in London, at Michael Goedhuis and Eskenazi; and in Hong Kong, at Alice King, Hanart TZ, and Schoeni Art Gallery. At Chambers Fine Art, works by Qiu Zhijie sell for $20,000 to $200,000, while Wang Tiande, who creates calligraphy with cigarette burns on rice paper, sells for up to $150,000. Ethan Cohen also shows Qin Feng, for prices as high as $500,000. Qin Feng, whose works have fetched $450,000 at auction, has created a series of silk screens with Pace Prints, priced at $2,500 to $10,000 for each print. "We see that interest in contemporary ink paintings is expanding, and the strongest interest seems to be among collectors who are already interested in modern Chinese paintings," says Elizabeth Hammer, Chinese-art specialist at Christie's New York. "However, I think it unlikely that contemporary ink will follow in the footsteps of contemporary Chinese art, as the collectors interested in these two areas, and the type of marketing and exposure dedicated to each, have been and continue to be quite different." One obstacle cited by those involved in this market is that Westerners have little education in classical Chinese art, so they have not developed connoisseurship in the field and may not be sensitive to the nuances or able to pick up the references in these more contemporary artworks. "I think about this all the time, because I am working in a museum in America and I am showing some of the finest objects of the Chinese tradition," says Sheng. "How to get people to accept that these works are so beautiful and so important is a challenge." He hopes that by pairing classical and contemporary, he will help the audience understand the works. "I think when we show contemporary and classical works together, the interpretation goes both ways. The classical works provide historical background for the new works, while the new works offer a new interpretation for the old ones." Gordon Cheung (born 1975) is a contemporary artist who captures the mood of the global collapse of civilization where moral, economic, and environmental crises have spun out of control. Spiritual undertones are balanced alongside familiar contemporary images including sources from popular media, cyberspace, nature, graffiti, kitsch, and historical painting. Cheung has recently used video animation and sculpture in his work, but focuses mainly on painting. He chooses bold colors and often paints on dense collages made from London's pink financial times listings with ink, oil, acrylic gel and spray paint. During an interview he has said of his work, "They're meant to be artificially luminous, a metaphor perhaps for the loss of that utopian vision of the future after the millennium bug threat, the .com crash, the collapse of Enron, the war on terror- and all before the current recession. Yet it's also meant to suggest a glimmer of hope." Cheung received an MFA from the Royal College of Art in 2001, and currently lives and works in London. Gordon's works can be found in major collections both in Europe and America including Elspeth & Imogen Turner Collection (UK) and Stephane Janssen Collection (USA), works from both collections are loaned to major museums on a regular basis. Chinese Artists in Europe are very far and few between. It is an oddity that in every town there's an art store, floor to ceiling art materials from the usual drolls of common western manufacturers, but nothing in the way of Chinese Art itself. Nothing! And yet in China, take HongKong alone, one can find stores that simply sell Brushes. paint brushes. And the Family that own the store will have made Brushes all their life. Further down the road there's a store that sells only seal stones. Nothing else. It's what their Family have made for Generation after generation. And further still... ink stones. Paper and so on. For some reason England itself is caught in some wierd mire of "If we cant hail ourselves as its creator, we can't have anything to do with it!" But then this isn't peculiar to Englanders. Let's take the books recently on the market explaining how it was, in fact, the Chinese who first circumnavigated the Earth. By some several hundred years in fact. Talk about upset the Boat of self-praisability standards. Now England has to rewrite the entire library of bloated self hailing History books... actually, so will the rest of the world. As England sits in a barbed wire sulk, it is, in fact, the Chinese who are more rebellious to confinement and closed thought. Berkshire alone last year saw an influx of some three thousands Chinese Citizens frequenting universities and opening three, yes that's 3, Chinese Supermarkets AND... ( here's the Frightener for those who refuse to agree that China, is in fact, more than a material used for making Tea Cups...) a Cash and Carry. All Chinese Stock. So what about the Art then. 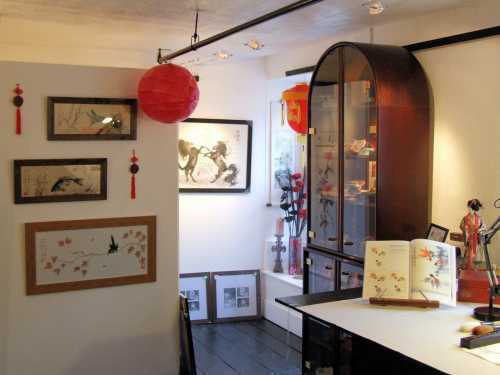 Well, we have Guanghwa in London Chinatown, a delicious little haven cellar of goodies for Art and Ornamentation. They have been there for half a century selling art materials to the residents of Chinatown and local Colleges for half a century. Also, they have just recently opened up another small Chinese Art outlet in Liverpool. Despite the idiotic incessant antagonisms RaggedyBird.com suffers from juveniles like SF108 in YouTube.com (And all the fake channels they have set up as hate channels towards RaggedyBird.com, RaggedyDragon.com and the ChineseCalligraphy YouTube Channel itself ) Chinese Art in Europe is scarce. Oops, that's a boat rocker for the Hate Mongers who, on the one hand promote the Chinese Arts in a "Look but don't touch" manner, and on the other hand contradict common knowledge in the name of Spite. Stats then show that Western Artists exist in society to a tune of 1 in every 34 people. Chinese Artists exist as 1 in (Close your eyes SF108) every 181,000. Well, I'm happy to stick that in my brush and paint with it. It's what I've discovered after all and as if that's not the cruncher, even with the beautiful diversity of the Chinese Arts itself let alone the actual delicousness of the visuals concerning the materials themselves, no one in England stocks ANYTHING Chinese Art Wise with any degree of seriousness. And if they do, it's normally a little jar of Paint Brushes they bought from Guanghwa anyway. Laugh!!! But the peculiarity of this issue is such that, when someone finally has the nerve to waken to this gaping maw in a potential market, (And the finances to boot; Diamonds are cheaper than Shipping from China currently.) the Art Scene will change for ever.